The likelihood of implant success could be increased through the use of a new, bacteria-repelling coating. Inhibiting bacterial attachment to implants enables the body’s healthy cells to “win the race” to bond to the implant’s surface. By inhibiting bacterial attachment, the new coating may decrease biofilm formation and subsequent rejection of the implant. Though implant technology is continuously improving, the failure rates of some implants remain remarkably high. This failure is sometimes related to the formation of biofilms on the implant’s surface. These layers are generally composed of bacteria and mucus-like excretions from the bacteria that impose themselves between the implant and the patient’s cells. Ideally, the patient’s cells should attach to the implant directly; when this fails to occur, the body is more likely to reject the implant. To increase the chances of implant success, a team of researchers from Singapore’s Agency for Science, Technology and Research (A*STAR), Nanyang Technological University (NTU), and University of Hong Kong has developed a new surface coating system with novel properties, according to a recent press release from the Institute of Physics (IOP). Their goal was to develop a surface that simultaneously promoted host cell attachment while inhibiting bacterial adhesion. Typically, the attachment of cells and bacteria is mediated by molecules that are bound to the surface of the implant. These molecules are called ligands, and the efforts of the team were focused on identifying novel ligand combinations that helped achieve their attachment goals. "The method we developed helped the host cells win the so called 'race-for-surface' battle, forming a confluent layer on the implant surface which protects it from possible bacterial adhesion and colonization,” professor Vincent Chan of NTU said in the press release. To examine the impact of various ligands, the researchers developed a multilayer model system, according to a study published in Biomedical Materials. Composed of dextran sulfate (DS) and chitosan (CS), the multilayer system was coated with the RGD peptide (short arginine, glycine, and aspartate amino acid chains), or collagen (CL). RGD peptides are well known for acting as adhesion mediating molecules for many cell types, as is collagen. Once the multilayer system was coated with these adhesion-promoting ligands, they were cultured with fibroblast, as well as the bacteria Staphylococcus aureus (S. aureus) and Escherichia coli (E. coli). 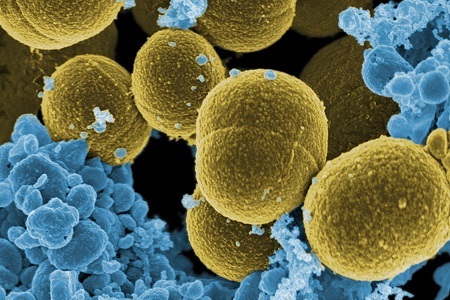 The presence of RGD peptide did not enhance S. aureus or E. coli bonding to the surface, though it did promote fibroblast attachment in culture. Alternatively, the CL surface was able to enhance fibroblast attachment, but it had the negative effect of also enhancing S. aureus and E. coli attachment as well. The team concluded that designing surfaces to optimize implant success was possible using these new methods. Advances continue to be made in changing the chemistry on the surface of a biomaterial to improve its performance. Changing the surface chemistry is not the only approach, however, as an implant’s surface texture may also contribute to how cells attach to it, according to a recent article on Med Device Online.